When choosing a video game for someone on your holiday gift list (or for yourself), wouldn’t it be good to know whether the game contains images that could trigger a seizure? The seizures caused by certain video game visuals are a health risk that most people don’t stop to consider. They’re also more common than people realize. So at this time of year I like to provide some guidance on seizure likelihood in the games you might be thinking of buying. I test the games recommended in holiday gift guides, looking for the types of image sequences that can provoke seizures. Today I’m reporting on the 10 video games suggested as gifts this year by the New York Times. Take a look at the introduction to the video games section of the guide. There’s no hint in the prose above that the “right destination” could involve more than the entertainment value of the game. The narrative reads as though the worst possible consequence of your buying choice could be a less-than-totally-fun game experience. The “right destination” stakes actually are much higher for some people, since seizures are pretty serious business. 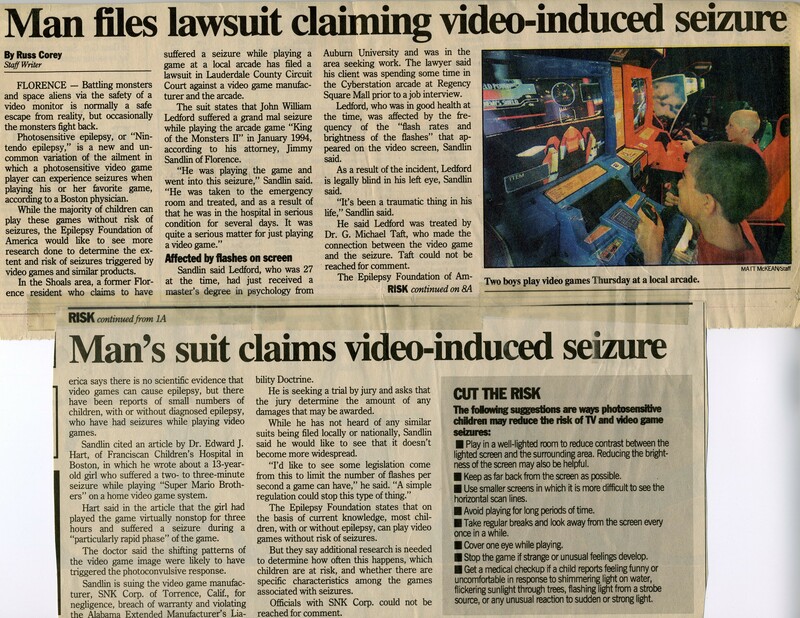 There is no practical way for consumers to know in advance whether a given video game contains the types of flashing and pattern movements that can provoke seizures. Games are rated for mature content and violence but not for seizure risk. One obvious clue, sometimes provided by the game studios, is the presence of lots of quick flashes in the promotional trailer. Visually provoked seizures can happen in individuals with no history of seizures. There is no way to know whether an individual might be at risk for visually induced seizures. They may not have encountered the specific visual provocation that leads to a seizure. Or they may have had a seizure while playing, without realizing it. Seizures can be hard to identify–many are very subtle and don’t involved falling down or lots of movement. Even subtle seizures, though, can be followed by significant impairments: difficulties with concentration and disruption of emotional control and sleep patterns. Which games in the Times gift guide appear to be OK? I’ll get to the details in just a bit of how I do the testing—there is no way I can test anywhere near all the scenes and story lines in a game. I’m not a one-person quality assurance department! Basically, after looking at and submitting multiple clips of a given game to an analysis tool designed for detecting seizure-inducing images, I eventually either find material that poses a seizure risk, or determine that further testing won’t uncover any. Please remember that there are no guarantees your results will match mine and that many variables affect a person’s susceptibility to visually induced seizures. I run downloaded gameplay clips, cinematic clips, and promotional trailers for each game and submit the sequences to an application called the Harding Flash and Pattern Analyzer. The FPA is widely used by producers and networks in the UK—including by the BBC—to reduce the risk of seizures from material on broadcast TV. I don’t know how many of the major game developers in this country use the FPA–they keep such information very much to themselves. If the first clip I test of a game fails the safety test, I note that and move on to test the next game. If no safety violations are found, I typically test at least 4 or 5 additional clips of that game–sometimes more, if I have a hunch due to the game genre and/or overall look of the sequences that there might be unsafe “footage” that I haven’t yet found. Games I’ve listed as safe could have seizure-provoking sequences that I was unable to locate. I don’t do this testing while actually playing video games. Instead I work with video clips available online, some of which are official marketing and gameplay trailers; others are cutscenes and gameplay sessions posted by reviewers or fans. I avoid testing any clips of gameplay from modified game software. Each person’s seizure threshold can be affected by a number of factors apart from the visual stimulus itself, including illness, hunger, stress, fatigue, alcohol, medications, length of play, and the player’s menstrual cycle, among others. So a game that ordinarily seems OK may trigger a seizure in that same player under different conditions. Holiday buying/year-end isn’t the only season for seizure guidelines compliance testing. I’ve tested additional titles this year. You can find results here and here. Also here. Thrilled to see you still at it. Did you hear about the gaming awards? I only heard about it on the radio the other night. I believe they award the artists and creators for their artistry. That would be a good organization to connect with. For the last couple of days–while still working on this post–I’ve had an open tab in my browser to remind me to read about the 2015 Game Awards…time to go look at it now. Thanks for the suggestion to connect with them! Happy Chanukah to you, too.